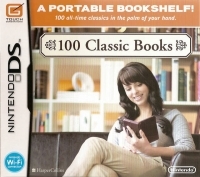 Description: 100 Classic Books transforms the Nintendo DS family of products into a library of timeless literature, highlighted by 100 works from authors such as William Shakespeare, Jules Verne, Jane Austen, Mark Twain and more. Readers can adjust the size of text, place bookmarks and even download new content via the Nintendo Wi-Fi Connection service. 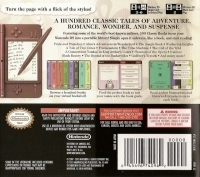 12-03-2012 moonstarraven Description 100 Classic Books transforms the Nintendo DS family of products into a library of timeless literature, highlighted by 100 works from authors such as William Shakespeare, Jules Verne, Jane Austen, Mark Twain and more. Readers can adjust the size of text, place bookmarks and even download new content via the Nintendo Wi-Fi Connection service. This is a list of VGCollect users who have 100 Classic Books in their Collection. This is a list of VGCollect users who have 100 Classic Books in their Sell List. This is a list of VGCollect users who have 100 Classic Books in their Wish List.